Especially for thinkers, doers and the curious who are seeking diverse and engaging experiences in a unique setting, Staten Island Museum is the place for exploring the dynamic connection between natural science, art and history since 1881. We share our passion for the world we live in through innovative exhibitions based on our multi-disciplinary collections, intellectually stimulating programs, scholarly research and enriching partnerships. The Staten Island Museum is a proud member of the Cultural Institutions Group (CIG), a public-private partnership with the City of New York, and receives operating support from the City of New York which owns its building through the Department of Cultural Affairs, Commissioner Tom Finkelpearl, from Mayor Bill de Blasio and the City Council, Speaker Melissa Mark-Viverito, with additional support from Staten Island delegation and the Staten Island Borough President, James S. Oddo. The Staten Island Terminal is served by the Staten Island Railway and the S40, S42, S44, S46, S48, S51, S52, S61, S62, S66, S67, S74, S76, S78, S90, S91, S92, S94, S96 and S98 bus routes. Visitors from Manhattan take the Staten Island Ferry from the Whitehall Terminal/South Ferry, which is a short walking distance from the 1, 9, 4, 5, N, R subway lines as well as the M1, M6 and M15 bus lines, to the Staten Island Terminal. Follow signs to the Staten Island Yankee Stadium. Exit the terminal and walk down the steps towards the ballpark. Turn left and walk up the ramp beside the ballpark. Cross Richmond Terrace. The 120th Precinct Police Station will be to your right. 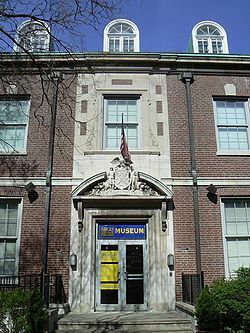 The Staten Island Museum is behind the police station — look for the "SI Museum" sign on the back of the building. Take the Staten Island Expressway (Route 278) eastbound. Exit at Clove Road. Stay to the left and make a left at the light onto Clove Road. At Victory Boulevard turn right. Go about two miles and turn left onto Bay Street. It will become Richmond Terrace at the Staten Island Ferry Terminal. Four blocks past the Ferry Terminal turn left sharply onto Stuyvesant Place. Make your first right onto Hamilton Avenue. Make the next left onto Academy Place. Make the next left onto Wall Street. Park in Allied Parking, which is on your immediate left. Let the attendant know that you are visiting the Staten Island Institute of Arts & Sciences so that you get a discount. Get a voucher from the museum receptionist to give to the attendant after your visit. Get on the lower deck of the Verrazano Narrows Bridge. Bear right after tollbooth and take the first exit to Bay Street. It will become Richmond Terrace at the Staten Island Ferry Terminal. Four blocks past the Ferry Terminal turn left sharply onto Stuyvesant Place. Make your first right onto Hamilton Avenue. Make the next left onto Academy Place. Make the next left onto Wall Street. Park in Allied Parking, which is on your immediate left. Let the attendant know that you are visiting the Staten Island Institute of Arts & Sciences so that you get a discount. Get a voucher from the museum receptionist to give to the attendant after your visit.